The spring/summer rainy season has started in some parts of the country and the summer thunderstorm season is near. With the rains come hazardous driving situations in the form of skidding and hydroplaning. Skidding and hydroplaning are two separate hazards but each has the same result and drivers who react instinctively could be headed for trouble while drivers, who have a plan in mind, can act correctly to avoid disaster. Skidding – Skidding occurs due to slick conditions on the road whether it be rain, snow, sleet, or ice. While people tend to be more cautious when driving on snow and ice, they don’t seem to show the same caution when driving in the rain and that can have disastrous results. In the periods between rainfalls, oil and grease build up on the roads and the warm sun keeps the oil and grease in a liquid state. The most dangerous time for slick roads in rain is shortly after the rain begins and there is a thin layer of water on the roads. Once it starts to rain, the oil and grease float on top of the water creating a very slick surface. The roads are at their slipperiest within the first half hour after it starts to rain. Eventually, the oil and grease will be washed down the drains and the roads will lose that slick coating of oil but that is not the time to relax because, as the rains increase, the conditions for hydroplaning increase. Hydroplaning – Hydroplaning occurs when there is standing water on the road and the depth is such that the car’s tires can’t squeeze the water out between the tire’s treads. If this happens, the tires will ride up on top of the water like a pair of water skis and lose all contact with the road. This can occur at speeds as low as 35 mph and becomes most dangerous at 55 mph or more. Tires – Few people realize that tires are the most important control device on your car. The steering wheel and brakes aren’t much good when the tires aren’t in contact with the road. Tires need to be kept in good condition and checked often for tread wear. 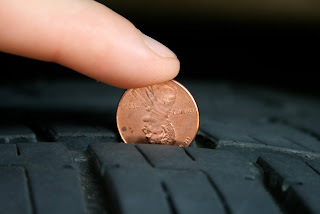 There should be a minimum of 2/32 of an inch of tread depth on your tires. A simple way to check the depth is by sticking a penny between the treads. If the top of Abe’s head is visible, your treads are too thin and your tires should be replaced. Brakes – Drivers need to be aware of the type of brakes they have on their car. There is a huge difference between standard brakes and anti-lock brakes when it comes to dealing with a skid. Standard brakes are not designed to stop your car in skidding conditions. When you lock up standard brakes, you are no longer able to steer the car. If you slam on standard brakes you are just going to make things worse and you could cause the car to careen out of control. If your car is equipped with standard brakes, DO NOT APPLY THE BRAKES until you have regained control of steering and your car has started to slow down on its own. Anti-lock brakes (ABS) are designed to prevent losing control of the car in a skid situation. They do this through use of a computer that detects when a tire is turning faster (trying to grip the surface) and applying pressure independently to each individual brake up to 20 times a second. This allows you to slow the vehicle while still being able to steer to avoid a collision. With the brakes pulsing that rapidly, the driver will feel a fluttering in the brake pedal. Unfortunately, many drivers, who are unfamiliar with ABS, feel this and think something is wrong and take their foot off the brakes. That is a big mistake! When applying anti-lock brakes in a skidding situation, you should expect to feel the brakes fluttering under your foot and understand that the system is operating correctly. Cruise Control – Cruise control is a great system to prevent speeding (and getting a ticket) and to increase your gas mileage. However, you should NEVER USE CRUISE CONTROL IN THE RAIN! If your tires start to spin, the cruise control will detect this and will try to correct it by increasing the speed. That is the last thing you want to have happen in a skidding situation. Take your foot off the gas! Again, you shouldn’t be using cruise control. If your car is equipped with standard brakes, do not apply the brakes. If you were applying the brakes when you started to skid, take your foot off the brakes. If your car is equipped with ABS, apply firm pressure to the brakes. You will still maintain control of steering while the brakes are applied. Steer the car in the direction of the skid. In other words, if the rear of your car is skidding to the left, turn your wheel to the left. Try not to look at the hazards but instead, look at where you want to steer the car and keep steering in that direction until you have regained control of the car. Once you have regained full control of steering and the car has slowed on its own, you may be able to apply standard brakes effectively to bring your car to a stop. Here are a few additional tips for Driving in the Rain and Sleet.